The growth of China's economy cooled to 6.6 percent last year, a natural slowdown resulting from the government's deleveraging attempt earlier in the year, and the escalating tariffs war between the world's top two economies which has disrupted trade flows and dented corporate investment enthusiasm in the second half. Facing mounting pressure to stop the economy from a hard landing, it is imperative for the central authorities in Beijing to ratchet up the magnitude of stimulus by maintaining a fairly loose fiscal and monetary policy, and continuing to upgrade China's industrial structure through targeted reform programs. As major economic benchmarks all fell back in December 2018, the central bank moved to add more liquidity to the market by cutting the reserve requirement ratio by 100 basis points in January. Further, the Ministry of Finance began to fast-track two tranches of major infrastructure projects throughout the country. To augment the fixed-asset investments - a major support of China's monumental growth for the past four decades, the impending National People's Congress, the top legislature, is widely expected to examine and approve more treasury bonds to support infrastructure investment. In addition to key infrastructure, the government could allocate more funds to invest into crucial technology upgrade projects, including advanced semiconductor chips, robotics, artificial intelligence, 5G mobile networks, latest generation nuclear power plants, and an extension of 5G and AI technologies to innovate and transform China's rapidly rising services industry. As foreign trade continues to be an important driver of the economy, the government should move to shore up the Belt and Road initiative - resolutely helping the less-developed countries in Asia, Africa, South America and Europe and increasing trade volume with those countries. More resources could be allocated to strengthen the initiative. After the people in those participating economies see the benefits to their own economies, there will be increased trade flows with China. Meanwhile, China could negotiate with the US and seek to clinch a trade deal and bring the 10-month trade war between them to an early end. The elevated tariffs have inhibited both countries, and caused rising uncertainty for the global economic outlook. Some naysayers have downgraded China's 2019 economic growth to around 5 percent, but the majority of Chinese economists remain upbeat. 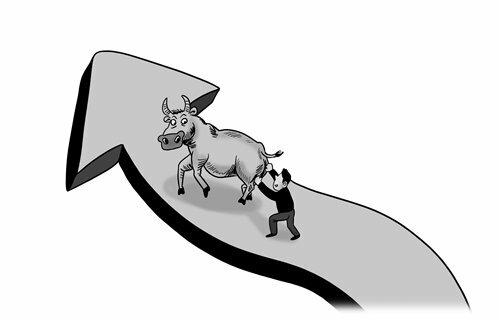 As the world's second largest economy has steadily grown to 90 trillion yuan ($13.3 trillion), it is obvious that it would be very difficult to continue with the 8 percent per annum GDP growth of previous years. However, the authorities in Beijing should roll up their sleeves and make the most of the policy tools at their disposal to ensure the economy expands at more than 6 percent in 2019 - so that it could create sufficient jobs for the needy and prevent the average household income from sliding. Without growth in the household income, domestic consumption - another major support of the economy - the consumption efforts could flounder. Only a healthy economic growth - supported by a sizable stimulus plan - seems capable of stopping the economy from cooling, and it would lift the broader market morale. During a recent meeting soliciting opinions from prominent Chinese entrepreneurs and scholars, Premier Li Keqiang pledged that the government will not allow a "precipitous slump" of the economy. It is a solemn promise. In addition to revving up government stimulus spending, China could also lessen its restrictions on housing sales, initiated in 2016 to cool escalating property prices. Restrictions on property transactions should be loosened so that property investment, another key driver of the economy, could rise. A dynamic housing market is a big plus to the economy. With a slowing GDP, the country's inflationary pressure will recede. However, if prices of major commodities keep falling and consumers are also forced to tighten their wallets, a vicious cycle of deflation could follow. Therefore, it is important to keep a close eye on market prices, and the central bank should stay alert, and be ready to cut the benchmark interest rates to hold off deflation.